Welcome bands, drummers and businesses: Whether you're a touring drummer looking for your own sticks to play with, or a band looking for the hottest new merch item, our custom logo drumsticks are ideal for both. Custom sticks are also perfect as a business promotional tool. How can you save me money on my order? Because of economies of scale, prices start getting really good at 50+ pairs. In addition, we sell directly from our shop in Maine (so you don't pay retail markups). Our wood selection is either 1st rate quality or high quality seconds only. How fast is your process? About 4-8 business days to complete + shipping time. However, if you need it faster, we can accommodate (note: extra labor or shipping costs may be added). Over 30 sizes to choose from. Just ask us! Shipping within mainland USA is a small $0.29/pair cost. International Orders = extra $1/pair for labor for filling out customs forms. Shipping rates will vary by country. 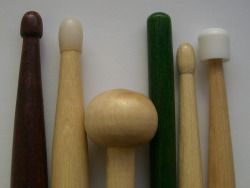 Stick pairing: $0.99/pair - we'll match your sticks for balance point, weight and pitch. Nylon tips: $0.99/pair - we offer oval nylon tips for most stick sizes. What colors can you make the sticks? We can leave them natural or color them: black, white, pink, red, blue, yellow, orange, and green. Can I make money with custom drumsticks? Absolutely. 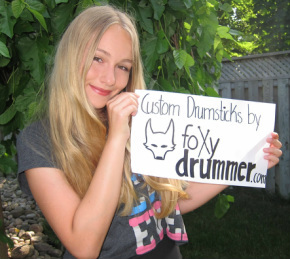 Many drummer/bands buy our custom drumsticks for $4.99/pair and resell them for $10/pair at their gigs. That's a 100% markup! Unfortunately no. However our offer is more advantageous since you have the ability to re-sell your custom logo sticks for $10/pair to your fans rather than get a slightly discounted stick that has a corporate logo plastered all over it. This gives drummers & bands the opportunity to make $5/pair at their merch table rather than spend $3/pair. Not sure if you're going to like our sticks and stamping? No problem. We'd be happy to send 2 pairs of your preferred stick size and 2-3 sticks showing logo work we've done for other drummers. Because of the high volume of requests, we ask that the drummer kindly covers the $12 for UPS shipping and our handling. please take a minute to tell us about your stick needs. Thank you. I want 1-29 pairs . . . Your artwork will be laser engraved. I want 30+ pairs . . . If you want, we'll send you samples for free. All you need to do is cover the $12 for shipping.